The cutting system is composed of 22 hammers to shred branches with maximum 30 mm diameter that are introduced into the main hopper and of 2 hardened steel blades to cut branches with maximum 65 mm diameter that are introduced into the side hopper. 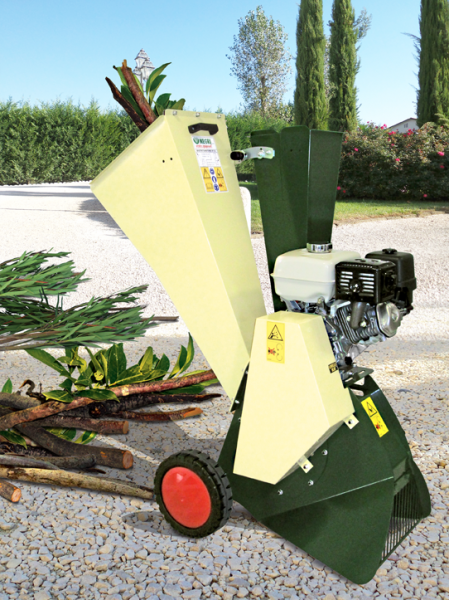 Compact and sturdy, the R130 bio-shredder can carry out heavy tasks too thanks to a belt transmission system that makes it safe even in case of accidental introduction of not suitable material. A mobile screen, placed at the exit of the shredded material, guarantees its fineness.